*£7.99 / £8.25 for the first 3 months. £17.49 thereafter on 12 month contract and £16.99 thereafter on 24 month contract. *12 and 24 month contracts commence after initial 3 month period. *£60 termination charge if SIM is terminated within the initial 3 month period, normal contract Ts & Cs apply thereafter. Our mobile SIM only deals offer you all the benefits of joining our business-only network with the best business Call, Text and Data rates in Britain. Eliminate bill shock with our managed service; a Telecoms World representative will oversee your calls, texts and data usage. We ensure that you see scheduled updates to your company data usage; allowing you to monitor and control your mobile spend, so if you get close to exceeding your business SIM only allowance, you will be notified to make changes to the users tariff and discuss the options. We offer the lowest call rates in the UK as well as consistently low roaming rates covering all 196 countries in Europe and across the world. Our business SIM only deals for small to larger businesses are perfect for getting a great deal for your business phone calls; without changing phones. Dedicated account management for your business SIM only. We have specialists on hand to assist and advise on managing your business account. 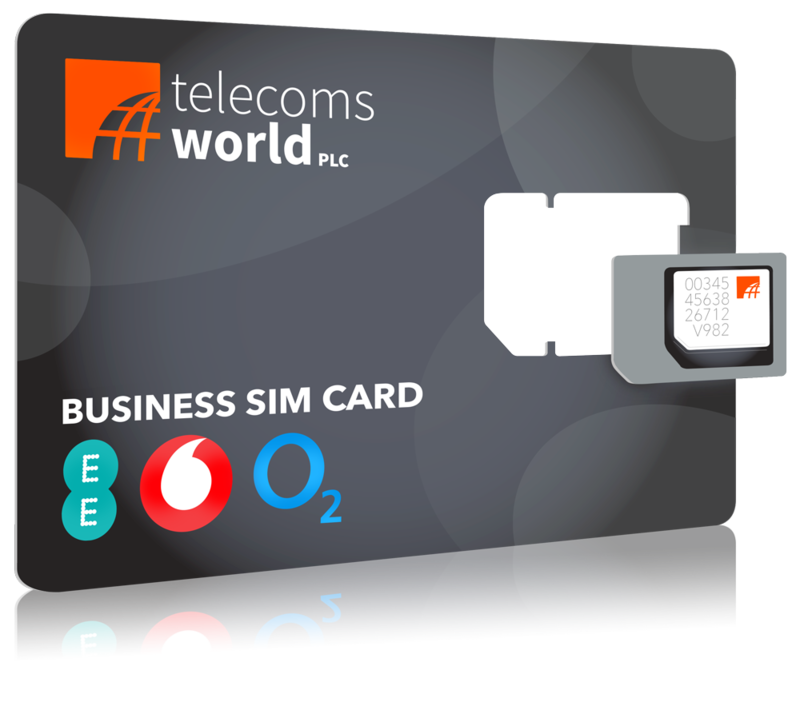 By working closely with Vodafone, O2 and EE, allows us to provide our brand new Business Mobile SIM only deals, exclusive to Telecoms World. We can offer you a range of services based around your business mobile needs, such as a fully serviced mobile connection, varying data-size SIMs providing superfast 4G connectivity, consistently low roaming rates covering all 196 countries, and daily usage updates from a dedicated account manager. - A range of business SIM card sizes to fit your phone. - Vodafone, O2 or EE 4G network, you decide what suits you better. - Dedicated account management of your mobile SIM only deal. - A range of inclusive minutes, text and data bundles available. Can I change my business SIM only deal mid-contract? Tailor and change your mobile SIM only tariffs or add/remove bundles through our easy to use portal or speak to your account manager anytime. With our EE contracts, there is also the option of aligning all of your contracts to have the same end date!! So if you are currently running various company mobiles on different tariffs and varying end dates - make it simple by coordinating your contracts on one manageable contract date and port your number to us today. Can I add users to my mobile SIM only package? Easily scale your business SIM only account up or down depending on your user requirements. We can send out additional SIM cards as and when you need them. How about using my mobile SIM only abroad? Roam like at home and use your allowance of Calls, Text, and Data in 196 countries the same as you would in the UK. Please contact us for further details. Why get lost in a large database of business clients with other providers? At Telecoms World we offer a dedicated account management team to assist you every step of the way and are easily on hand to help with any questions or queries. Each SIM only deal has its own volume of data in MB (Megabyte) of between 500MB up to 20GB, with all data carried at 4G across the Vodafone, O2 or EE network. Our exclusive Business Mobile SIM only deals offer all the benefits of joining our business-only network with the best line rental rates in Britain - from only £7.99* per month for 20GB plans with unlimited calls and text. We provide you with a dedicated account manager who will send daily usage updates allowing you to monitor and control your monthly spend, eliminating bill shock altogether. If you do happen to get close to exceeding your allowance, your account manager will contact you immediately to discuss the options available. We also offer the lowest call rates in the UK and consistently low roaming rates world-wide. Our specialists work with EE, Vodafone and O2 to provide unique business only tariffs; all wrapped in a managed service to ensure that bill shock is a thing of the past. Our Cheat Sheet for business mobile helps you define user types based on data use, overseas travel and daily usage of minutes and texts; to start building a plan to suit your business needs.